I’m really stoked to use Mark Fidelman’s Eyefi campaign as an example of outreach marketing at its finest. As you know by now, I’m passionate about the weaving of creative and smart marketing. We are about to dive into an outreach marketing campaign that scored epic brand recognition with a brilliant marketing plan. And while we’re at it, we’re going to explore the process of one of the thought leaders in the influencer marketing world. Oh, and Oprah will make a guest appearance in this post. How many times have we heard the story? A company that has a genuinely cool product but they don’t have the awareness that they deserve. So, we devise creative ways to influence the influential so they can in return influence potential consumers. Sometimes we may even stalk them on social media and jump up and down like children in front of a camera desperate for their attention. It’s a little tiring and honestly, unnecessary. When working with influencers is approached from a vantage point in which you find a way to help them, the process suddenly becomes tangible. A mutually beneficial harmony is created and becomes a foundation for an ongoing relationship. This is exactly what Mark Fidelman’s company Evolve! did for Eyefi. In every well executed campaign there is an innovative brain and a genuinely good product. Allow me to introduce the key players in this month’s outreach marketing case study. Meet Mark Fidleman from Evolve! and a company called Eyefi. For all of those who don’t know Mark, he’s what many would call an influencer in the world of influencer marketing and social media. Mark has spent over 20 years working with the world’s top brands and thus has a plethora of knowledge when it comes to marketing trends. He writes a column for Forbes and has an awesome book which contains secrets and knowledge from his experience. Mark was cool enough to give me a high level overview of his “secret sauce” when it comes to influencer marketing. To illustrate Mark’s marketing philosophy in action and tie in some actionable tips that anyone in any industry can start applying, we are going to work through a real campaign. Which leads me to my next introduction: A company called Eyefi. Eyefi has a really cool product I’d never heard of until recently. They sell an SD card that you can put into any type of camera and your photos will go straight to the cloud. Neat! Let’s take a look at how we can find our Oprah, shall we? Before plans are drawn up, emails are templated, and campaign hashtags are circulating, a pulse needs to be tapped. You must have a pulse on what type of influencers your potential consumers are looking to and a pulse on what those influencers are talking about, engaging with, and what would interest them. I’m going to reiterate that last point because it’s crucial: Think about how you can help these influencers and what you can do to interest them. Not the other way around. Don’t campaign based on what you think you know, do the research. Read blogs, spend time on certain social platforms, dig through hashtags. You’ve created buyer personas to lead you to these verticals now create influencer personas. Once these verticals were identified Mark and his team spent over 120 hours researching these niches and with a proprietary algorithm, identified the most influential photographers on the web. The photographers in the infographic and thus the photographers that eyefi wanted to work with aren’t just people who take good pictures. They are also active on social media. Can you see how this campaign could have flopped without a firm requirement that each person possess both traits or be part of both verticals? When it comes to engaging with and getting the attention of the people you want to work with for a brand, everything becomes so much easier if you “look at it as a relationship or a friendship instead of a campaign.” Seemingly simple, but so powerful. The recognition phase is the most important but just be prepared for the fact that this phase milks the most creative juices and takes up the most space on the clock. Contrary to the way we normally do things, recognition in marketing is done best when delivered before the act is even asked for. How did Mark do this with Eyefi? Well, he and his team put in 120 hours of work doing research and putting together an infographic of the most influential photographers. 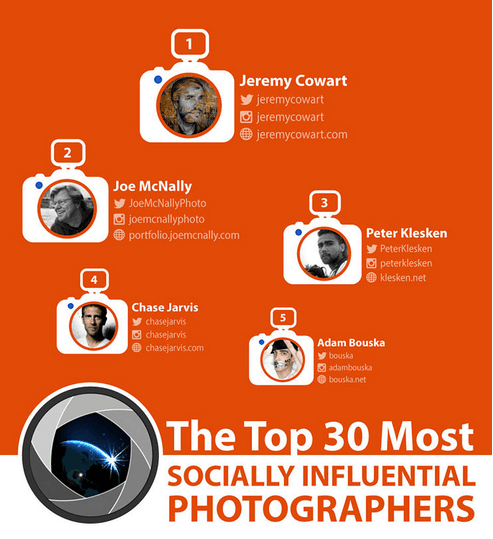 Each photographer is highlighted as an influencer and their social information is readily available. It recognizes the photographers for their talent before creating relationship. The research was valuable for many people in the industry. It helps promote the photographers with whom they want to work. It acts as a portfolio piece for the highlighted photographers. It’s a sharable piece of content with Eyefi’s branding on it. The infographic was a success, it spread like wildfire (every marketers dream), and Eyefi was stoked. Now that we got that out of the way, let’s dig just a little deeper and look at what else surfaced as a result of this smart infographic. It’s been 4 weeks since the release of the infogrpaphic, and Eyefi has a stronger relationship with these influential photographers. The infographic has been viewed by over 17,000 people, countless more have seen it on other sites. Eyefi is partnering with the photographers to co-create more content. Are you seeing the snowball effect that is happening here? Co-creation of content ensures that both parties make out swimmingly. They’ve created a win-win scenario with the most influential people in the space and they plan to live happily ever after. Do you have a creative way that you have helped influencers so that they can help your brand? Please share in the comments below and let’s have an amazing discussion about this topic!